This is Africa's one and only native penguin. Other common names include the "African penguin" and, more comically, the "Jackass penguin". Less than two feet tall, It's one of the smaller penguin species. They have sort of a hobble-like walk while on land but can be very swift underwater. Flight is out of the question, as it is for all penguins (birds in the order Sphenisciformes)(6). Black-footed penguins are found along the coastlines of southern Africa. 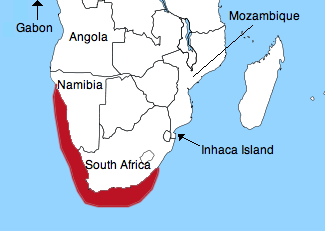 Most of the population occurs off shore of Namibia and South Africa. Though black-footed penguins are only known to breed on Islands and coastlines of Namibia and South Africa, they have been found as far up the western coast as Gabon and as far up the eastern coast as Inhaca Island, Mozambique(7). Breeding colonies most frequently occur on small offshore islands. BirdLife International reported breeding populations on 25 islands and four mainland locations across South Africa and Namibia, citing the University of Cape Town's Avian Demography Unit as a source(2). Penguins established mainland colonies in South Africa for the very first time in the 1980s. Changes in the locations of colonies are most likely a result of penguins following their food supply. A possible example of this, Robben Island (map, below), the location of the prison in which Nelson Mandela was held, was re-colonized by penguins in 1983(4). Just 9 breeding pairs of birds founded the colony. By 1995, there were 3100 breeding pairs on the island. The birds were still here when I visited the Island in 2010. I spotted one individual while riding a tour bus to the prison (now closed as a prison but open to tourists). The black-footed penguin is listed as endangered by the International Union for Conservation of Nature (IUCN) and is included on their Red List of Threatened Species. Decreasing population sizes are primarily attributed to the harvest of penguin prey species (namely anchovies and sardines) by commercial fisheries(1). Close relatives include the Galapagos penguins (Spheniscus mendiculus), and two species of South American penguin (S. humboldti and S. magellanicus). The black-footed penguin, together with it's three closest relatives, account for all extant (non-extinct) members of the genus Spheniscus. 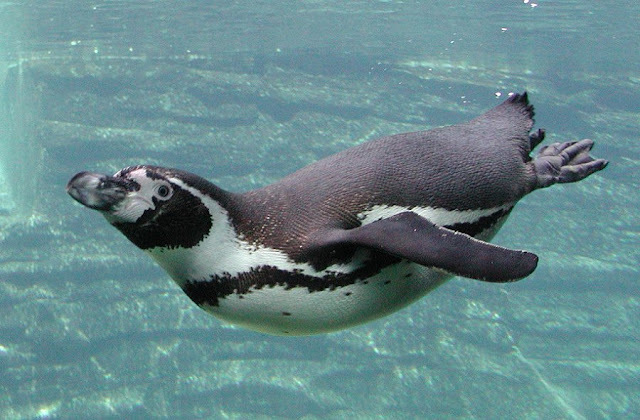 Black-footed penguins eat mostly anchovies and sardines(3), but may also feed on herring, mackerel, and pilchards. Non-fish menu items include squid (a mollusk) and crustaceans(7). Cape fur seals and sharks are known to prey on adult penguins from time to time(2). Gulls and mongooses may prey on penguin eggs and chicks. Feral cats also pose a threat(1). Black-footed penguins have been clocked at underwater speeds up to 12.4 kilometers per hour (11.3 feet in one second)(8). The patches of bare skin above their eyes are used for thermoregulation. Slowing blood flow to the capillaries beneath the exposed skin helps to retain heat, while increasing blood flow helps to lose heat. In intense heat, the skin will be a bright pinkish red(2). Another common name for this species is the Jackass Penguin. This bird's mating call sounds very similar to the sound a donkey makes. Penguin colonies can be visited and enjoyed by Tourists. Most of the photos on this web page were taken at Boulder's Beach, South Africa. Black-footed penguin guano was once harvested for use as fertilizer(2). Sheniscus demersus, Boulders Beach, South Africa. Spheniscus demersus preening at Boulders Beach, South Africa. Note the pink regions above eyes for thermoregulation. Spheniscus demersus at Boulders Beach, South Africa. Parent with offspring in nest burrow. Spheniscus demersus, at Boulders Beach, South Africa. Spheniscus demersus, chick, at Boulders Beach, South Africa. (3) Crawford, RJM, L.G. Underhill, J.C. Coetzee, T. Fairweather, L.J. Shannon, A.C.
Science. Vol. 30, Iss. 1. Francisco, CA: Pearson Benjamin Cummings, 2009. Journal of Marine Science.Vol. 2, Iss. 1. (8) Wilson, RP. 1985. The jackass penguin (Spheniscus demersus) as a pelagic predator. Marine ecology progress series. Oldendorf. Vol. 25, no. 3. Enter you email address in the space below if you would like a new Wildlife Monthly post delivered to your inbox once a month. What continent should the animal for next month's post come from? Tyler is a wildlife research assistant at the University of New Hampshire, USA. Here, he completed his Master's degree in Wildlife Biology after studying Environmental Science at the University of Connecticut. Following his passion for wildlife, he has conducted reptile and amphibian research for the state of Connecticut, worked as a zookeeper's assistant, traveled to South Africa, fallen into swamps, and helped track bobcat populations in New Hampshire. When he is not studying nature, Tyler is an active musician and songwriter. Wildlife Monthly © 2012 by Tyler Mahard. Picture Window theme. Theme images by zbindere. Powered by Blogger.